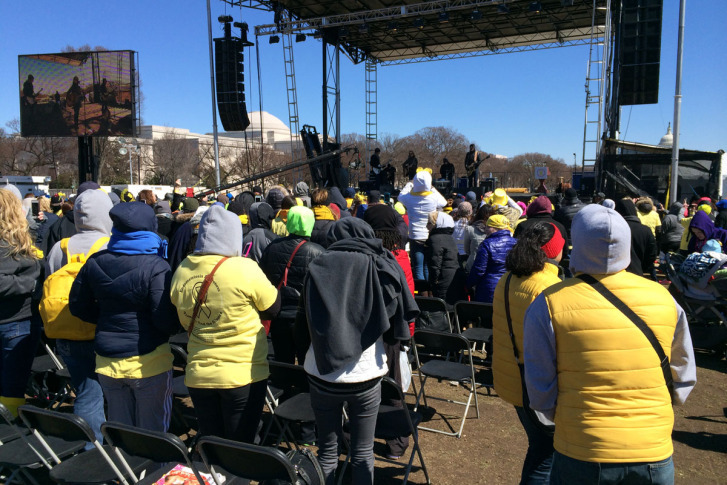 WASHINGTON — Wearing yellow ribbons and shirts, hundreds of women gathered on the National Mall Thursday to raise awareness about endometriosis, a common health problem that affects women’s reproductive health. “Women with endometriosis, they have a lot of pain. They have a lot of abnormal bleeding and they suffer,” said Dr. Azadeh Nezhat, who comes from a family of doctors who helped to organize and fund an awareness campaign. Endometriosis is a hormone and immune system disease where the tissue lining the uterus grows outside of the womb. Nezhat says many women don’t realize that they have it. She says it is not normal for women to menstrual pain that prevents them from doing things that they enjoy. According to the Endometriosis Association, women from 8 to 80 can suffer from the symptoms of endometriosis. According to WomensHealth.gov, research has shown a link between endometriosis and allergies and between endometriosis and certain cancers. “Young girls and women come to see you with the same story that it takes them five to 10 years to be diagnosed,” said another doctor, Dr. Camran Nezhat, a pioneer and top practitioner in the field of laparoscopic surgery and the founder of the 2014 Million Woman March for Endometriosis. Many times women are misdiagnosed with other conditions, such as irritable bowel syndrome, he said. “We decided to do something about it because publications in the medicines hasn’t been enough,” Dr. Camran Nexhat said. Dr. Robert Wah, a reproductive endocrinologist and obstetrician-gynocologist from McLean, Va., who will be sworn in as president of the American Medical Association in June, said endometriosis affects 200 million women. “There isn’t enough research. There isn’t enough education, and there isn’t enough training to help the millions of women who suffering from this debilitating disease,” Wah said. “By raising awareness we want to seek support from the lawmakers and the public for getting more research dollars and getting more activity to increase the education in this field,” Wah said. The crowd at the first annual march braved a cold and windy D.C. afternoon to share stories and provide inspiration and encouragement to others. The lineup included Grammy award-winning artist Sheryl Crow, who took the stage for a free concert. “It’s freezing but we’re glad to be here to bring some attention to this cause. It’s great to find some awareness for something that can be and is often times is misdiagnosed,” Crow said. Mary Lou Ballweg, executive director of the Endometriosis Association, she says it took doctors 15 years to diagnose her with endometritis. “I was told like everyone else that it was in my head,” Ballweg said. Ballweg said there is a lot of work ahead to get the word out about the illness. “Until we can get women and families, society in general, to start to understand that a normal bodily function, such as menstruation, is not meant to be painful, we can’t change this,” Ballweg said. Kate Tocco says it wasn’t until she was pregnant that she found out that she suffered from the disorder. “I was told that I had lost him, that I had a spontaneous abortion. I turns out I didn’t have a spontaneous abortion. All I had was an endometriosis cyst erupt,” Tocco said. Tocco has had 18 surgeries since then and the disease has spread to her lungs and bowel. Lindsay Murphy is among those with endometriosis who hope to see medical advancements when it comes to detection and treatment. “The fact that the only way to diagnose me with endometriosis, is to make incisions in my stomach and stick a camera in there, we need minimally invasive/noninvasive screening tests,” Murphy said. Murphy said her diagnosis occurred differently than with most women. “I had no pain, completely asymptomatic until the end of 2010, and at that point I thought I was going to die,” Murphy said. Stephanie Marsh, the actress who played Alexandra Cabot, on “Law and Order,” also has endometriosis. “There is a pretty regular (health) checklist for women and their physicians. There is not one reason to not add endometriosis to that checklist,” she said.